Rooftop Readings NYC. It’s fairly simple and straightforward: readings on rooftops. But the name is more than a physical location — it’s also an idea. We see this as an experiment in re-appropriation of an underutilized space, where we can use the environment and the cityscapes to enhance the experience of attending literary readings. Independently, each activity is poetic and profound, offering equal escapes from a city of constants. Together, they equal an entirely new creation. How often are you able to stand on a rooftop and view the skyline of Manhattan? You’re listening to excellent writers read while watching the sun slip behind a city containing the best literary community in the world. Three nonfiction writers (from The New School): Artrit Bytyci, Demetri Raftopoulos, and Brett Rawson. We welcome any expression — (slam) poetry, storytelling, essays, short stories, memoirs, or otherwise. We search for creativity and try to pair together a lineup of readers that speak to each other. We have a microphone, projector, and coolers of beer. Multimedia and thirst can be accommodated. We also have the best pico projector, thus we can showcase various projects anywhere we want. The format is in constant flux, as everything about our readings are seasonal – the time, reader’s material, our outfits, and beverages. We announce each event ten days in advance, since that is the best weatherpeople can do. As for the event itself, we have two light readings before sunset and two dark readings after sunset. And in between, we have an intermission, as well as an inter-mission, while watching the city put on its make-up. Each reading is limited attendance, since rooftop safety is first, but beer-safety is second — we provide heavy drinks and light bites at no cost to our readers or listeners. The venue moves between different rooftops of NYC. Monthly, and very seasonal (see above). This is the our first season. We hosted our inaugural reading in August 2015 and are looking forward to the September reading at the moment. The event filled up in three days, and we enjoyed the 60-person gathering and breaking view from a shipwreck-looking roof. A combination. For the inaugural reading, we reached out to our four readers. While it is an aboveground reading series, it is also an underground reading series — we rely on word of mouth to reach our readers and listeners, and so we also ask our readers to recommend others and rely on them to bring in new listeners. We welcome people to send us their material if they are interested in reading. We love getting to know new writers, readers, and thinkers. No. So, yes. We didn’t expect the first event to fill up in three days or to have 60 people on the first rooftop. We hope to learn a lot from our successes, but also even more from our failures. We are approaching it the way scientists view an experiment. This adds a level of uncertainty but also excitement. But we don’t think it can go severely wrong. So long as we have a rooftop, sunset, beers, and stories, we are happy. That it is both an aboveground and underground series. We exist online, but we rely mostly on word-of-mouth. And the view and beverages are free of cost to everyone who attends. We want to provide more spaces that can serve as commons to our communities. 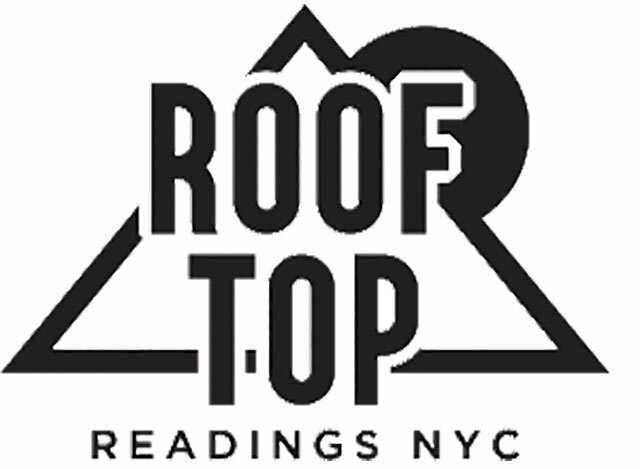 The next Rooftop Readings is scheduled for Monday, September 14th, 2015, weather permitting. Check rooftopreadingsnyc.com for information regarding location, weather, and RSVP.